If you read the previous blog post you will know that cancer has entered my life for a second time; however its now a close family member that is affected, which for me, seems harder to bear than my own diagnosis. It's tearing me apart to see someone I love so much being worn down by a rare and aggressive type of cancer knowing that there is nothing I can do. We hear so much about people "fighting" cancer; it seems that every cancer patient has to become a champion fighter in order to beat the dreaded "c" word! But what about those who choose not to fight? Does it mean they are somehow not as good or weak willed? 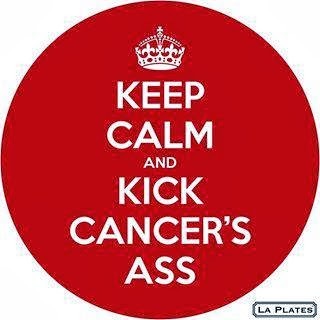 Do you only deserve to beat cancer if you fight hard enough? I have admired the way that former Dr Feelgood guitarist Wilko Johnson has handled his terminal diagnosis of pancreatic cancer; they told him back at the beginning of 2013 that he had 10 months to live. He decided against having chemotherapy that might only have given him a couple of months extra and is still here, playing gigs and enjoying his life to the full. Listen to him explain why he made that decision. Sometimes as cancer patients we have to accept that fighting is futile and although it may hurt those who are the closest, we hope they will accept the decision. All cancer patients are brave - those who choose to fight to the end and those who accept the end is inevitable and bow out gracefully. It doesn't mean that cancer has won; it just means that those of us that are able to fight will fight even harder for everyone else.